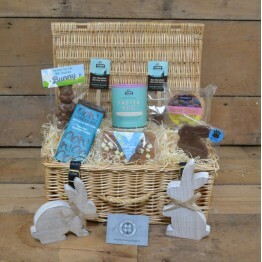 South West Hampers provide perfect presents for Easter, showcasing specialist food and drink from producers across the West Country. 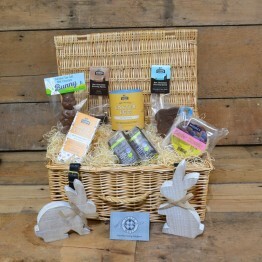 Share the joy of Easter with friends, family and colleagues by choosing one of our Easter hamper range, packed full of locally made chocolate, cakes and biscuits, offering something for everyone. All hampers, including any from our other ranges, will be wrapped in an Easter themed ribbon and come with a free personalised gift card. Although the cut off time for guaranteed Easter delivery (mainland UK) has passed, we can still hand deliver to any address in the Devon area up until midday on Easter Sunday. 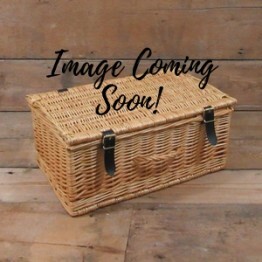 When placing an order, please select the nearest delivery date available on the automated calendar and then email us with your preferred delivery time and date. 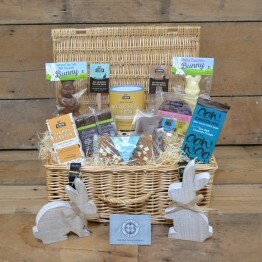 Our little Easter Parade hamper includes white, milk, and dark chocolate treats, nestled in a luxury..
A truly extra special Easter hamper, including hot cross bun and honeycomb flavours to truly tempt y..
Our take on Easter by the seaside, with a salted caramel chocolate themed hamper. Our best sel..
Our sumptuous chocolates and cakes add some fairy dust to our luxury, indulgent Easter hamper. Incl..